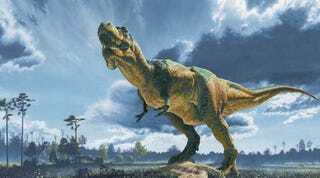 One of the biggest mysteries about dinosaurs is whether they are ectotherms or endotherms - in other words, cold-blooded like reptiles or warm-blooded like birds. Now there may be a way to figure it out using minerals on dinosaur teeth. While dinosaurs certainly look like giant lizards, the current evolutionary consensus is that they're actually more closely related to birds. Still, the difference is small enough that paleontologists don't feel comfortable concluding one way or the other on whether dinosaurs could regulate their internal body temperature. The possible solution to this conundrum lies in a mineral known as apatite, a key component of animal teeth and bones throughout this planet's history. The heavier isotopes of oxygen and carbon have a unique way of bonding in the biological forms of apatite; basically, the lower the temperature, the more likely these isotopes are to clump together. "If you can measure the clumping accurately enough, you can work out the temperature at which a mineral precipitated. In the case of teeth and bone, this will be the body temperature of the organism." Eagle and his fellow researchers first tested this method on mammal species both living and extinct, including elephants, woolly mammoths, and a 12 million year old rhinocerotid. Testing on the apatite of the elephants yielded results within a couple degrees of the living animals' actual internal temperatures, which bodes well for its applicability for older species. The team then added cold-blooded species from a range of eras, including a Miocene alligator species that was contemporaneous with the rhinocerotid species. Again, the results were remarkably consistent with known figures, and it was found the cold-blooded creatures were about six degrees cooler than their warm-blooded counterparts. This held true for the ancient alligator and rhinocerotid, which makes Eagle and company optimistic that this can be applied to even more ancient species. Although venturing into species as ancient as the dinosaurs - anywhere from sixty-five to hundreds of millions years old - is new territory for this technique, the potential benefits are enormous. Figuring out the development of endothermic body temperature would be a huge breakthrough for evolutionary biology, and the temperature readings for cold-blooded species may provide a fairly accurate figure of average temperatures when the dinosaurs lived.